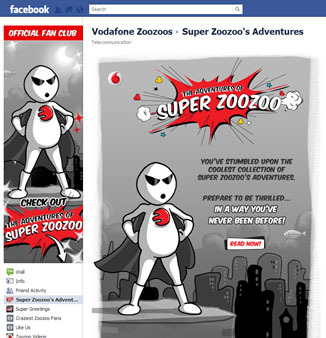 Super ZooZoo on Facebook now has his own Comic Series and a dedicated video page with TV ads. This one is a dynamic Facebook Brand Page (and also one of the earlier Facebook integrations) with new uploads and promos every few months. 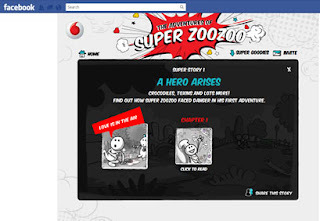 The Comic Strip titled ‘The Adventures of Super ZooZoo’ promises edge-of-the-seat Action, Suspense and Drama in a cheeky intro. The comic strip has been built in a chapter format to keep the fun and engagement going over a period of time, with the 2.7million (and growing) fan base. I guess new chapters will be introduced every week, for now Prologue and Chapter 1 are live. The scenarios end in questions (rather abruptly, I thought), the answers to which would be revealed next week. The creative rendition though, cannot be faulted. What we are seeing now, could also be the teaser before the Super Hero ZooZoo Rises next week! This seems like a natural extension for the Super ZooZoo 3G stories on social media, leveraging the merits of the Facebook platform.